The Quey Percussion Duo were featured at the Performing Arts Institute of Wyoming Seminary Kingston, PA on August 1. Included in their program was a new version of "Window Schedule", which Gene has revised for the performance. (Seen here is the new animation with the soundtrack from the original Premier performance of November 2006). We are pleased to announce that Jeff will be performing the solo version of Reliquary on New Year's Eve for Hartford's First Night celebration at the Wadsworth Atheneum's Aetna Theater. Performances are at 3:30 and 4:30 PM. Boston Cyberarts performance @ AXIOM GALLERY. Jeff gave a great performance of the solo version of Reliquary at Axiom Gallery to an enthusiastic group with spill-over from folks at the Megapolis Festival tuesday night. See pics by Rob Coshow (left) and read the Cyberarts blog here. We were pleased to participate in the festival and share a Q&A session with the audience. Jeff performed "tyvek recycled", an improvisation with footage from the "Underwraps" section @ Capitol Community in Hartford, CT. A recording of the piece can be heard at acdcvc on YouTube. "Parallel Media: Convergence in the Classroom", the paper we presented @ Kassel last August, will be presented at this conference in Connecticut, February 28, 29 and March 1, 2008. In June we refashioned a Solo version of Reliquary which we recorded in the Video Studio of the Hartford Art School. This version is now editied and posted on the solo performance page of this site. "Parallel Media: Convergence in the Classroom", the paper we presented @ Kassel last August 2008 , and the New Creativity Symposium, Connecticut College, New London, CT has been published in the International Journal of the Arts in Society by Common Ground Publications - International Journal of the Arts in Society Volume 2, Issue 6. On March 20th Jeff's project, VIDEOCELLO, traveled to Mumbai, India performing concerts sponsored by the US Embassy at the Embassy's American Center Auditorium. This program premiered the solo version of Reliquary along with Jeff's repertoire. Performances also took place at Indian Public School, Rajnandgaon for the K-12th grades, and at Tagore Hall on the 28th in Bhilaspur, both in Chattisghar, India's newest State. We have updated the premier page and remixed the premier performance audio for these clips. 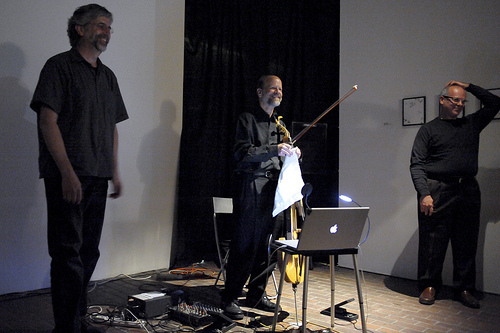 We have edited documentation of the premier performance from last November. It is posted on the front page of the site as "premier performance". These clips approximate the live event with multiple video channels. 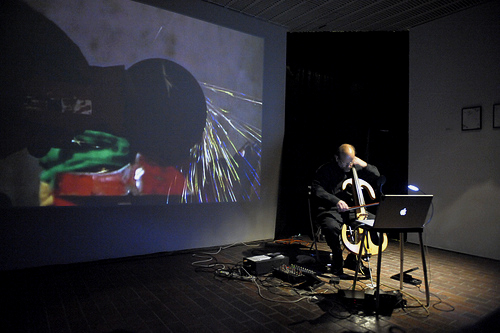 Jeff is developing a solo piece based on the composition and video from the Under Wraps section of Reliquary. He will incorporate this into his touring solo performance repertoire in the near future. The Premier Performance of Reliquary went well and was presented to a standing-room-only audience at the New Britain Museum. We would like to thank everyone involved in this success and we will be posting excerpts from the residency and performance on the podcast page in the coming weeks. We now move on to travel this performance to festivals and new venues in the coming months and further develop the online components here. We have plans to develop "No56 Variations", a limited edition DVD using various parts of the work in a new composition for distribution slated for spring/summer 2007. New Thoughts, New Music: Measure for Measure is a podcast series hosted by Phil Blackburn. This installment features Ken speaking very articulately about the project; collaboration and podcast features. This is a feature on the American Composers Forum site that you can subscribe to. Listen to the podcast here. We're very happy to announce that Lief Ellis will be joining the Reliquary of Labor project as our Real-time Physical Computing Integration Specialist. Internally we are referring to him as The Integrator. Lief will be responsible for the integration of a variety of sensors: pressure, light, accelerometers etc., that we will be using in conjunction with a Teabox (from ElectroTap) and MAX/MSP. We are very excited and relieved to have found such capable hands to take care of this important aspect of our upcoming premiere performance. HB Group of North Haven, CT has generously agreed to provide technical video and audio support for the residencies and performances at the Museum. We are grateful to Donald Guzauckas, Jr., general manager of HB, for his comittment to supporting the arts in our region. We have acquired custom video production gear from the studios of Dave Jones Design which will enable synchronous multi-channel DVD and video switching and display. Dave has produced the switcher to be compatible with MAX/MSP architecture and can be operated using manual triggering, MIDI interface or pre-programmed. 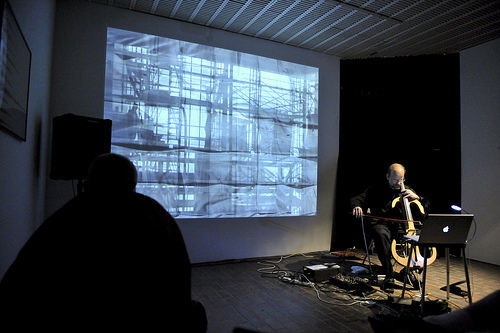 Dave's most visible work has been with video artists Gary Hill, Diana Thater and Laurie Anderson. He's a wizard and very artist-friendly. Jeff joined Gene and Ken at the MacDowell Colony for a couple of days to experiment and work on Reliquary. 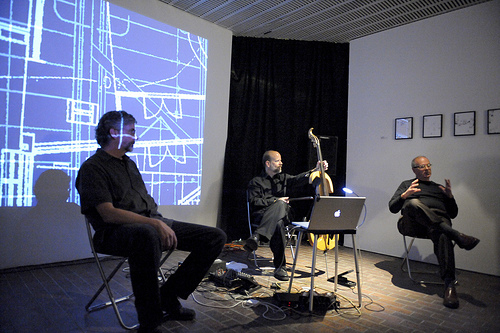 Listen to the preview performance of one section that we gave at the colony on 05.30.06. The Quey Percussion Duo [Tim Broscious and Gene Koshinski] will be the featured percussionists in the performances of reliquary. We're really fortunate to have them on board! The April 30th preview of Reliquary of Labor was a huge success. We received a lot of insightful comments and other feedback that will be very helpful to us as we continue work on this piece. Thanks to all of you who came. We look forward to seeing you at the next previews scheduled for August 31st @ 4:00 & 6:00 pm at the New Britain Museum of American Art.